The name of the corporation is San Juan Island Food Connections dba San Juan Island Food Cooperative (hereinafter called the Co-op), a Washington State Non-Profit Corporation. The Co-op shall be organized and operated for the promotion of good nutrition, education thereof, health and social and economic welfare. This includes, but is not limited to, providing high quality, environmentally sound food at the lowest feasible costs and the promotion of education concerning such products to the community and to Co-op members. 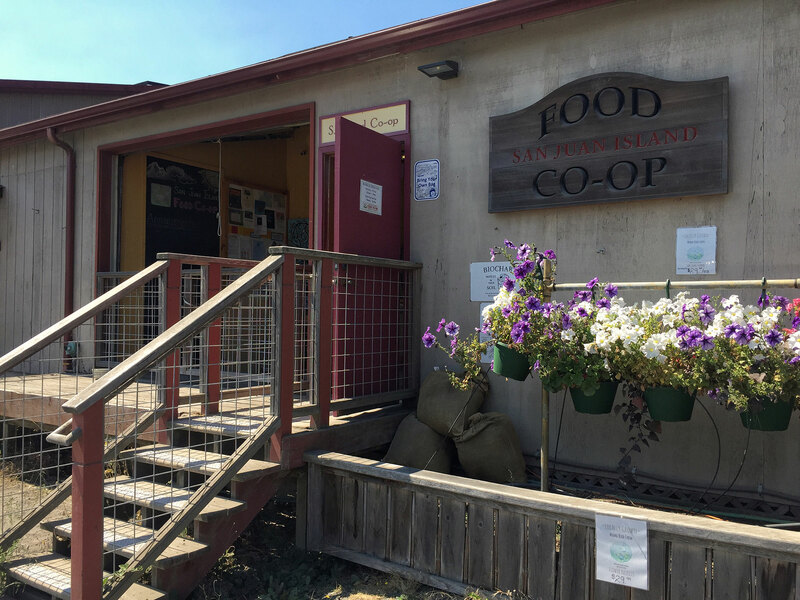 The San Juan Island Food Co-op strives to provide access to local and regional food and goods that are organic, sustainable and fairly produced with the smallest carbon footprint. The Coop encourages conscientious consumption and nurtures community connections. No part of the net earnings of the corporation shall be for the inurement of or be distributable to the members, Directors or Officers of the Co-op, except that the corporation, by and through the Directors, shall have the authority to pay reasonable compensation for services actually rendered to or for the Co-op. All solicitation and posting on Co-op property shall be approved by the Manager. The principal place of Business is 775 Mullis Street #C, Friday Harbor WA 98250. The corporation may maintain additional offices at such other places as the Directors choose to designate. The Co-op shall not discriminate on the basis of age, color, creed, disability, gender, national origin, race, religion, political affiliation or sexual orientation. Membership in the Co-op shall be held by becoming a member of a Co-op Household (hereinafter called Household).Each Household will pay the annual membership fee and agree to support the Articles of Incorporation and these By-Laws. A Membership Household shall consist of adults who shop and prepare food together. The Board of Directors reserves the right to limit the number of adults who may utilize a Household Membership. Each registered Household is entitled to one vote at General Membership meetings and elections. Standard Membership: For a Membership fee to be determined by the Board of Directors, this Household will be entitled to make purchases from and use the services of the Co-op. The Board is empowered to create separate categories of Membership as required, with adjusted fees and benefits. The list of members shall be used solely for Co-op business. Memberships must be renewed and fees paid on an annual basis. All Memberships shall be subject to renewal annually, one year from the date of initially beginning Membership.The annual membership fee will be set by the Board and will be recorded in the Policy Manual. Adopt, review and revise Co-op long-range business plans, including feasibility, fundraising, etc. Ensure adequate audit of Co-op finances performed no less than once a year. The Board of Directors of the Co-op shall consist of seven (7) members. A consensus of the Board of Directors may, at any time, increase or decrease the number of Directors of the Co-op as set forth in the Articles of Incorporation, subject to the following limitation. A majority of the Board of Directors must be in attendance to constitute a quorum. A quorum must be present for business to be conducted at a meeting of the Board of Directors. Decisions made and actions taken by the Board of Directors shall be decided by a simple majority of the Directors present. The standard Term of Office for each position on the Board of Directors shall be two (2) years. Terms of Office shall be staggered, with elections held at the Annual Meeting. The positions shall be numbered 1-7 and the ending dates of the terms designated as follows: Positions 1, 3, 5 and 7 shall be elected in odd years and Positions 2, 4 and 6 shall be elected in even years. The Board of Directors may from time to time adjust Terms of Office as necessary to promote such staggering, or allow a minority of one-year Terms of Office, subject to the foregoing limitations. The termof office of Directors shall not be affected by any decrease in the number of Directors so made by the Board of Directors. Each Director elected shall hold office until her/his term expires. The business and affairs of the Co-op shall be managed by its Board of Directors, which may exercise all powers of the Co-op as specified in the Articles of Incorporation, the By-Laws, and other lawful acts.Emergency powers: Officers of the Board are authorized to make emergency decisions without convening, in accordance with provisions set in article VIII, B 1; subsection b. Any member who abides by the Articles of Incorporation and the By-Laws will be eligible to run for a seat on the Board of Directors. No Household may have more than one (1) member on the Board of Directors at a time. Co-op employees and the spouses or domestic partners of Co-op employees can serve on the Board of Directors with the stipulation that they cannot participate in the Review Committee or vote on issues that would have a direct impact on their or their spouse’s employment as determined by the remainder of the Board. Such persons shall be limited to two. The Board of Directors shall be elected by the General Membership. A minimum of 10% of total members must vote for the election to be valid. Votes may be cast by a Household or by proxy, in person at the Co-op, or by email. Nominations shall be open for one month prior to the Annual Meeting and nominations shall close prior to votingduring Annual Meeting. Nominations may be made by any voting member, and a candidate may nominate her/himself. Nominees must accept the nomination before their name shall be placed on the ballot. The election period shall extend from the Annual Meeting for a minimum of one week. Any vacancy occurring in the Board of Directors, for any reason other than an increase in the number of Directors may be filled by an agreement of two-thirds of the remaining members of the Board of Directors. Such appointment shall be subject to ratification at the next General Membership meeting. The appointee shall serve the remaining Term of Office of the vacated position. Decisions and actions of the Board of Directors during such time between the filling of such vacancy and the next General Membership meeting shall be considered valid, whether or not the member appointed to fill the vacancy is ratified by the General Membership. If the number of the Board of Directors is increased, any new positions must be filled by the General Membership in the manner provided in this Article, Section E.
Any Director may resign at any time by giving written notice to the Board of Directors. Unless otherwise specified in such written notice, the resignation shall be effective upon delivery to the Board of Directors or a designated Officer. The Secretary will duly record such a resignation in the Minutes of the following Board meeting. Not meeting the minimum requirements stated for eligibility in Article VI, Section G.
A Director who is removed by the Board may appeal that removal to the membership and ask for a Special Meeting of the membership to review the allegations, evidence and defense against the charge. Members of the Board of Directors are considered volunteers and are subject to the same compensation structures that have been established for all Co-op volunteers. To the fullest extent permitted by Washington law, a director of the Co-op shall not be personally liable to the Co-op or its members for monetary damages for conduct as a director, except for liability of the director for acts or omissions that involve: intentional misconduct by the director; a knowing violation of law by the director; intentionally wrongfully distributing Co-op assets; any transaction from which the director will personally receive a benefit of money, property or services to which the director is not legally entitled. Nominations of Officers shall take place at the first Board of Directors meeting when new members join the Board of Directors. Selection of Officers shall be made by agreement of two-thirds of the Board of Directors within the first two meetings. We recognize the Washington State Statute requiring the offices of President, Vice President, Secretary, and Treasurer. Officers of the Co-op shall include President, Vice President/Policy Recorder, Secretary and Treasurer. Other duties will be delegated to members and Officers of the Board of Directors as the Board of Directors sees fit. The General Membership shall meet at least annually, in the first quarter of the year at such time and place as shall be determined by the Board of Directors. A General Membership meeting may also be called at any time by written petition signed by a quorum (10%) of the General Membership of the Co-op and submitted to the Scribe. The presence of 10% of total households or 50 registered members, whichever is less, shall constitute a quorum. A quorum must be present for business to be conducted. All matters shall be decided by the vote of two thirds of members present at a meeting at which a quorum is present, unless otherwise provided in the By-Laws. At any time a 10% quorum of Membership will be empowered to bring a binding vote of action/policy change by Membership at large. A 10% quorum of Membership is needed to make a decision concerning Co-op capital investments, projects or physical moves. Proxy or voting in absentia shall be granted if less than 25% of Co-op Membership is in attendance at any given meeting in which a vote is taken. The time to legitimize vote by proxy shall be determined by the majority of Membership in attendance at such given meeting. The term of voting in absentia shall last at least a week and after that, if needed, until 12 a.m. of the day that the total number of qualified votes equals the quorum of membership households.The final winners shall be determined by simple majority. The Board of Directors shall meet as often as necessary, but no less frequently than monthly. An emergency meeting to address a situation requiring an immediate decision may be called at the discretion of the Board of Directors. Any decision made by the Board of Directors at said meeting shall be reflected in the minutes of the next meeting. Board voting via email is allowed. All meetings of the Board of Directors at which Co-op business is conducted shall be open to the General Membership. The Board of Directors may close meetings at its discretion to discuss personnel matters, legal matters or other items that require private discussion, voting as outlined in Article VI, C and D.
Whenever notice is required to be given to any Director or Member concerning Annual meetings, General Membership meetings, Board of Director meetings, and special meetings or concerning changes/amendments to Co-op By-Laws, such notice may be given by posting said notice at the principal place of business and by posting on the website. Such notice shall be posted up to, but no later than, two (2) weeks prior to the specified date, except that the notice for the Annual Membership meeting shall be no later than one month prior to the specified date. Delivery of notice of Board of Directors and Committee meetings shall be by posting in a conspicuous place at the Co-op’s principal place of business at least two weeks prior to the meeting. Delivery of notice shall be required in the manner set forth in Article IX, Section A, whenever a resolution for an amendment to the Articles of Incorporation and/or these By-Laws is to be presented for ratification.In addition, said notice shall also set forth or have attached thereto the proposed amendment or amendments to be ratified. Compensation: Any Member or Director of the Co-op can be authorized by the Board of Directors to receive reasonable compensation from the Co-op for services rendered to the Co-op. No member may receive compensation merely for acting as a member. The Co-op may contract to purchase consumer goods furnished by Co-op member households. No Member or Director of the Co-op shall have an interest, directly or indirectly, in any contract relating to the operations conducted by the Co-op, nor any contract for furnishing services or supplies to the Co-op, unless the fact of such interest shall have been disclosed or known to the Board of Directors at any meeting at which issues relevant to such contract are discussed. The Board of Directors is responsible for overseeing contracts with and compensation of the Manager. There may be the following standing committees for the Co-op: Operations Committee, Financial Committee, Building/ Maintenance Committee, Communications Committee, Membership and Volunteer Committee and Outreach Committee. Other committees, temporary or standing, may be formed at any time, as directed by the Board of Directors and drawn from member volunteers. Evaluate the Co-op volunteers and provide the Board of Directors with recommendations regarding compensation, policy, etc. The Operations Committee shall consist of the Co-op managers and Board of Directors representation, and may also include no more than five (5) other Co-op members. The Operations Committee shall meet at least once a month. The Board of Directors may provide direction to the Operations Committee as it deems necessary. The Financial Committee shall consist of the Treasurer of the Board of Directors and at least two (2) other Co-op members. The Board of Directors may provide direction to the Financial Committee as it deems necessary. The Building Maintenance Committee shall consist of a member of the Board of Directors and other Co-op members. The Board of Directors may provide direction to the Building Maintenance Committee as it deems necessary. Prepare and distribute election announcements to the Membership at the Annual Meeting and to the Board of Directors. The Communications Committee shall consist of a member of the Board of Directors and other Co-op members. The Board of Directors may provide direction to the Communications Committee as it deems necessary. Actively participate in Community events, such as festivals, agricultural meetings/workshops and represent the Co-op by attending business functions/endeavors, such as attending Chamber of Commerce meetings, etc. The Membership and Volunteer Committee shall consist of one Board member and at least two other Co-op members. The Board of Directors may provide direction to the Membership and Volunteer Committee as it deems necessary. To research a network of regional food sources, focused on local production. The Corporate Fiscal Year for the Co-op’s accounting shall be from January 1 to December 31. Board Action: In order to voluntarily dissolve the Co-op, the Board of Directors must adopt a resolution recommending dissolution and direct that the question of dissolution be submitted to a vote of the Membership. Notice: Appropriate notice of the vote must be provided as required by R.C.W.24.03.220. Vote Needed: The Co-op may be dissolved by a 2/3 vote of the active Membership. No other regular meeting business items as described in Article VIII, A., 2 may be transacted at a special meeting called for the purpose of dissolving the Co-op or on a ballot issued for the purpose of dissolving the Co-op. Procedure: Upon dissolution of the Co-op, the Board of Directors shall supervise the winding up of business, the paying of debts, and the equal distribution of assets to the Membership. No proxy vote shall be taken upon Membership vote concerning the question of dissolution.